It has been the dream of many a fan of the Metal Gear Solid series for some time now to engage with the game’s universe as the Cyborg Ninja. In Metal Gear Solid: VR Missions (Integral in the US and Japan), the player was given the opportunity to play through some scenarios as Grey Fox, the illusive cyborg of the first MGS title, but this never quite lived up to the aspirations of the players who had become besotted with this wonderfully agile character that would so perfectly realise the desire to navigate the game’s world as one of the borderline supernatural entities contained within. 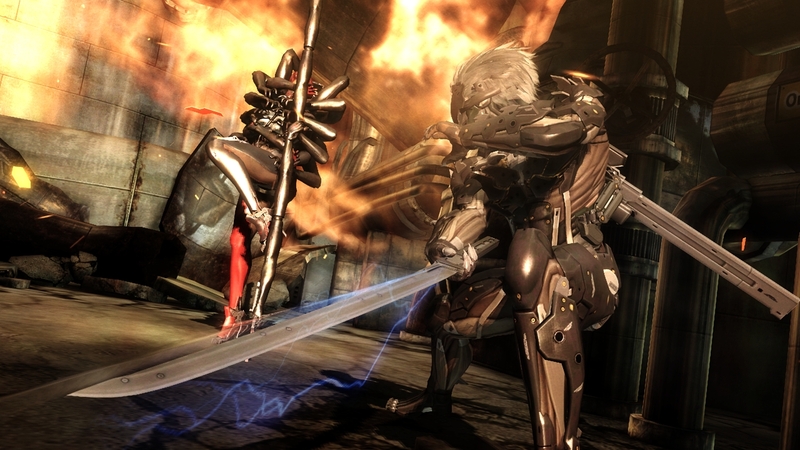 Metal Gear Rising: Revengeance is the culmination and realisation of a fifteen-year dream to play a Metal Gear game that is driven by a strong character more concerned with action than avoiding detection. This change in tone is evidenced from the first moment that the player sees the stylised “P” of the Platinum studios logo, and only the hints contained in the script, presence of an alert phase and presence of Metal Gear characters in the game point at the game being one of the franchise: Metal Gear Rising is manic, action packed and unrelenting in its continual throwing of frenetic challenge at the player. It is a wonderful piece of fan service that never falters from providing pangs of tension, excitement and elation in equal measure. Metal Gear Rising has the same eccentric character design that has characterised the series. Raiden returns for a second outing as the player character in a Metal Gear game, somehow seeming sentient of the fact that it took the loss of his human body to endear him to the somewhat fickle fans of the series whose loyalty is contingent solely upon the presence of Solid Snake as key protagonist. Upon taking control of Raiden for the first time, it becomes even clearer that everything that they believe they know about how the game will feel to play is wrong and that this is very much of the Platinum school of gameplay design: at its core, a frantic hack-and-slash game but with room for tactical play decisions. The high-frequency blade that debuted with the end of Metal Gear Solid 2 returns with a vengeance, invigorated with a control system that handles far better than the right analogue stick waggle that defined the previous use of the weapon. The expected light and heavy attacks with the sword from knowledge of Platinum’s legacy titles are present, with a delightfully satisfying parry mechanic bolted on. This parry mechanic constitutes the majority of any defensive action that will be taken by the player and does feel somewhat unintuitive upon starting to play the game: pressing the left analogue stick in the direction from which an attack is coming and then pressing the light attack button is a departure from the traditional approach of merely pressing a shoulder button to block, but once the the timings of enemy attacks have been worked out, it makes for a mechanic that rewards precision with a counterattack, but does not punish inaccuracy too harshly in still allowing for off-timed parry maneuvers to have defensive efficacy. Once the surface level of complexity is cracked, it becomes difficult to see how defensive action in the genre could be done in any other way. The most publicised facet of the game’s play comes in its Blade Mode: a free-cutting extension to the swordplay enabled by pressing L1. When in this mode, the camera moves closer to Raiden’s shoulder, with a line being drawn on the screen to indicate the location and direction of the slash to be performed. 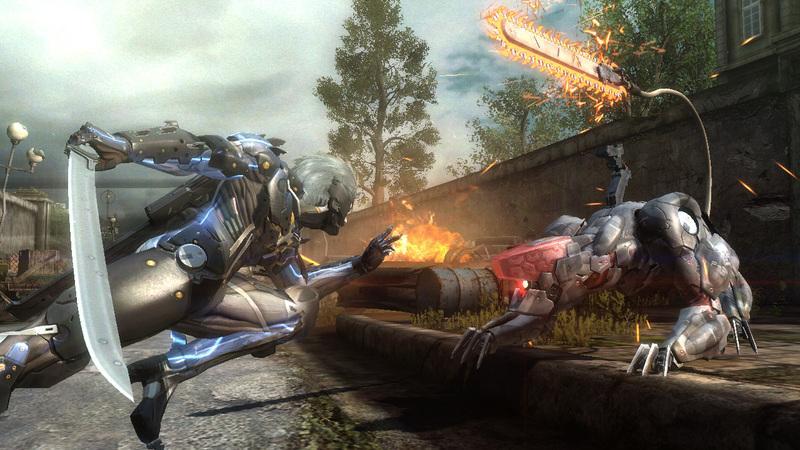 This mode enables for the precision required to remove limbs from larger enemies, allowing for their easier dispatch, and for the precision required for the removal of the spines of cyborg enemies required to regenerate Raiden’s energy. This Zandatsu move – the targeting and removal of enemy energy stores – becomes particularly poignant upon a certain character development point for Raiden, when his Ripper Mode becomes available. Somewhat akin to Devil May Cry‘s Devil Trigger, this mode allows Raiden to do more damage to heavily armored foes, and in a way that underlines fantastically the issues of morality and motivation that plague Raiden throughout the narrative. Having sufficient energy in the form of these fuel cells also allows for Raiden to enter Blade Mode in a state where time is somewhat slowed in order to allow for either a greater number of cuts or more finely-tuned slices in the free-cutting mode using the right-analogue stick. A variety of subweapons are made available throughout the game, adding a little variety to combat. The combat system rewards patience as much as brash impatience. As would be expected by something scripted by Kojima Productions, the world is populated with a cast of colourful characters, from the likable supporting cast to the eccentric and invariably flawed cast of key antagonists. Each boss fight is as much an exploration of the characters of the game as a contained session of combat. Debates are had as to motivations, ethics and consequences amidst the clashing of swords, with the manners of fighting employed by each boss pointing to their own back stories with a certain nostalgia that is only ever charming. This charm in the face of ridiculousness is something that has defined the series thus far, and Metal Gear Rising does not disappoint in this regard. Codec conversations are as engaging as ever, with the dynamics between characters never being a simple matter of one sided discussion: the codec conversations with Sunny later in the game are particularly lovely in this regard, with both parties seeking to reassure one another that all will be fine when all is said and done: again, there is so much charm, even in the fundamentally optional elements of intercharacter conversations. For everything good in this game, however, there are some pitfalls: the camera is somewhat sluggish to respond to movements of enemies and even Raiden himself at points. When certain enemy types are terrifyingly agile, it does a disservice to the wonderful fluidity of the game’s combat to have to be slicing blindly at where enemies are thought to be, rather than where they are known to be. In an otherwise incredibly solid game, this is somewhat of a disappointment. Additionally, its length (at around five to seven hours for a playthrough) may lead some to question it’s £39.99 pricetag. Fans of the series, however, would most likely be willing to pay anything for another slice of one of gaming’s most uniquely eccentric universes. Metal Gear Rising is a triumph of collaboration: a seemingly unlikely pairing between Kojima Productions and Platinum has resulted in a wonderfully coherent end-product that honours both KojiPro’s legacy in storytelling across the series and Platinum’s ability to turn any combat into a blissful exercise. Though its runtime may be a short one, it engages consistently and constantly, with no conceits being made to appease any particular type of fan. This is a game with its own identity, and a strong one at that. Throughout the game, it never feels like a second is wasted.